Courtney Joseph is a graduate of the Moody Bible Institute with a degree in Evangelism and Discipleship. She is a leader in the Christian blogging community and she has over 1.5 million views on YouTube. She is the founder of the ministry Good Morning Girls, where she is leading women through the Bible, chapter by chapter, cover to cover. She married her high school sweetheart and homeschools her son and daughter. 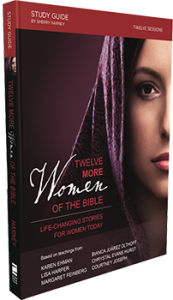 In this twelve-session video Bible study, some of today’s best-loved authors and speakers look at the spiritual lessons learned from twelve women in the Bible and what they mean for you today. This fresh look at these women in the Bible will help you discover new insights into God’s character, persevere through difficult times, and find joy in the hope that Jesus has provided to you.